Combine the broccoli and stock in a saucepan and simmer until tender (about 10 minutes). During the final minute of cooking, drop the garlic in the pan. Puree the contents of the pan in a blender until very smooth, working in batches if needed (and be careful blending hot liquids, don’t fill your blender’s cup too much). Once the soup is fully pureed, add yogurt and reheat very gently, adjusting seasoning with salt and pepper. If desired, top the soup with slivered almonds, or croutons. 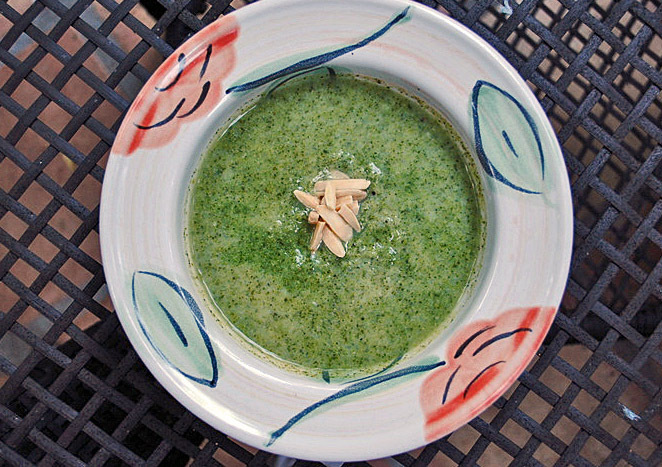 Comments: Mr. Bittman says you can use leftover broccoli cooked by any method as a starting point for this soup. Remove excessive dressing or sauce, boil some stock, add the garlic and the cooked broccoli together for a couple of minutes, then proceed with the recipe. Instead of yogurt, you can finish it with milk or cream, but of course those will increase the fat content. I made this soup to take to work for lunch, so I kept it as light as possible, just added some slivered almonds for extra crunch. Combine o brócolis e o caldode galinha (ou agua) em uma panela e cozinhe até ficar macio (cerca de 10 minutos). Durante o minuto final de cozimento, coloque o alho na panela. Bata a sopa no liquidificador tomando cuidado para nao encher o copo do liquidificador com o liquido quente. Coloque a sopa de volta na panela, adicione o iogurte e aqueca suavemente, ajustando o tempero com sal e pimenta. Se desejar, decore com lascas de amendoas ou croutons. It’s fall, and cooler days here on the east coast. And, soups are a great way to warm the insides. For some reason when brocoli is put in a soup in England it is always combined with blue cheese, Stilton or something like that, which I am really not too keen on. Your soup sounds much lovelier than that and like Celia I am going to have a go. But it will have to be shop bought broccie! Indeed, many veggies soups resort to a cup or more of heavy cream, and even though I admit it makes them very luscious, I rather keep it much lighter and keep the veggie as the main ingredient.